We are long overdue for a raise in the minimum wage. 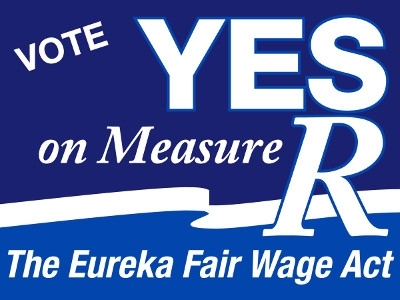 Working class people of Eureka need a victory that will improve their lives — and the Fair Wage Act will be that victory. The minimum wage must be indexed to inflation to insure that those at the bottom share in the growth of our economy. We must reverse the trend of 2 percent of the people in the U.S. solely capturing all the benefits of improved productivity and innovation. It is theft of peoples’ time, labor and ideas.In Eureka, we cannot rely on politicians. We’ve come together and created an ordinance to strengthen our community by giving the lowest paid workers a long overdue raise. The federal minimum wage was first established in 1938 when FDR signed the Fair Labor Standards Act, which also established the 8-hour day, paid overtime, and child labor protections. The FLSA emerged, over the violent opposition of businessmen, due to strikes, pickets and other actions of brave working people. In 1938, and with every worker-benefiting amendment to the FLSA since, politicians, business leaders, and think tanks have opposed the minimum wage, claiming myriad suffering the “minimum wage horror” would cause the fall of the American empire, devastation of businesses, “more misery and unemployment than anything since the Great Depression” (Ronald Reagan, 1980). However, the minimum wage and its increases improved economies of all sizes, holding only benefits for employers and workers alike. From 1938 to 1968 , the purchasing power of the minimum wage increased by over 140 percent. Minimum wage workers saw a positive upgrade in their living standards as wages rose in step with productivity growth. If the federal minimum wage kept pace with improved productivity of workers it would now be over $20 an hour. Had it increased with the rising cost of living, even by conservative calculations, it would be over $10.50. California is a high cost-of-living state with the lowest minimum wage on the west coast, $8 an hour. It’s time to raise wages and tie them to inflation. As we circulated the Fair Wage Act throughout Eureka, the responses were no surprise: People want and need to bring home decent pay. People know their time and labor are valuable. Corporate profits are at record highs; it is past time for those profits to be shared with the workers who produce them. Forces that oppose higher wages say they’re concerned about job loss — never considering job loss when it comes to raising CEO pay. Increasing the minimum wage, especially during high unemployment times, has been found throughout various geographical areas and time periods, to either have no effect on employment or, more often, stimulate job growth. We have 75 years demonstrating that as wages rise, employment rises. Humboldt folks might find relevant a study by Princeton economists comparing the effect on employment in New Jersey to employment across the river in eastern Pennsylvania, after New Jersey raised the minimum wage and Pennsylvania did not. The border there is slight, neither a barrier to commerce nor employment. Employment rose in New Jersey when wages rose. Employment stayed the same in Pennsylvania with the stagnant minimum wage. This pattern happens throughout the U.S. where one county raises wages and the neighbor county does not. Employment improves where the minimum wage is higher. People and the economy need a boost in Eureka. Most minimum wage workers, a majority of whom are women, support households. Too many households are struggling on low wages to meet rising food, housing, transportation and health care costs, with no retirement fund. A higher minimum wage is just. It will help start an economic surge in our communities, increasing spending, business viability, and creating new jobs. Support the Fair Wage Act. Kimberly Starr and James Decker, Eureka residents, are signatories to the Fair Wage Act initiative. For more information, visit fairwages.org. Actually, it’s easily addressed with one simple act: restore the minimum wage to its 1969 level, and adjust it for the inflation that has been officially under-reported.If you go to the Bureau of Labor Statistics Inflation Calculator and plug in $1.60 (the minimum wage in 1969 when I started working summers in high school) and select the year 1969, you find that in 2012 dollars the minimum wage should be $10 per hour if it were to match the rate considered “reasonable” 43 years ago, when the nation was significantly less wealthy and much less productive. The current Federal minimum wage is $7.25, though states can raise it at their discretion. State rates runs from $7.25 to $8.25, with Washington state the one outlier at $9.04/hour. In 40 years of unparalleled wealth and income creation, the U.S. minimum wage has declined by roughly a third in real terms.“Official” measures of inflation have been gamed and massaged for decades to artificially lower the rate, for a variety of reasons: to mask the destructiveness to purchasing power of Federal Reserve policy, to lower the annual cost-of-living increases to Social Security recipients, and to generally make inept politicians look more competent than reality would allow. The full extent of this gaming is open to debate, but let’s assume inflation has been under-reported by about 1% per year for the past two decades. That would suggest the minimum wage should be adjusted upward by about 20%, from $10 to $12/hour. All those claiming such an increase will destroy the nation (or equivalent hyperbole) need to explain how the nation survived the prosperous 1960s paying the equivalent of $10-$12/hour in minimum wage. Exactly what has weakened the economy such that the lowest paid workers must bear the brunt of wage cuts? If the minimum wage had been increased at the same rate as the price of gas, the minimum wage would be over $21.00 per hour today. “The Santa Fe metropolitan area provides an ongoing real-time experiment in the impact of a fairly high minimum wage on the economy. Santa Fe currently has the strongest economy in New Mexico. Since April of this year, Santa Fe employers have been required to pay a minimum wage of $10.29 an hour. The Santa Fe Living Wage ordinance initially set the Santa Fe wage at $8.50 an hour in 2004. It was raised to $9.50 in 2006 and, because it is indexed, has increased at regular intervals since that time. The unemployment rate in Santa Fe County—at just 4.7 percent—is the lowest of New Mexico’s four metropolitan areas. Job growth in Santa Fe is now at 2.1 percent, which may not seem impressive until one considers that the other three metropolitan areas are still losing jobs. Most of the job growth was in the leisure and hospitality sector—the sector most affected by the living wage floor.